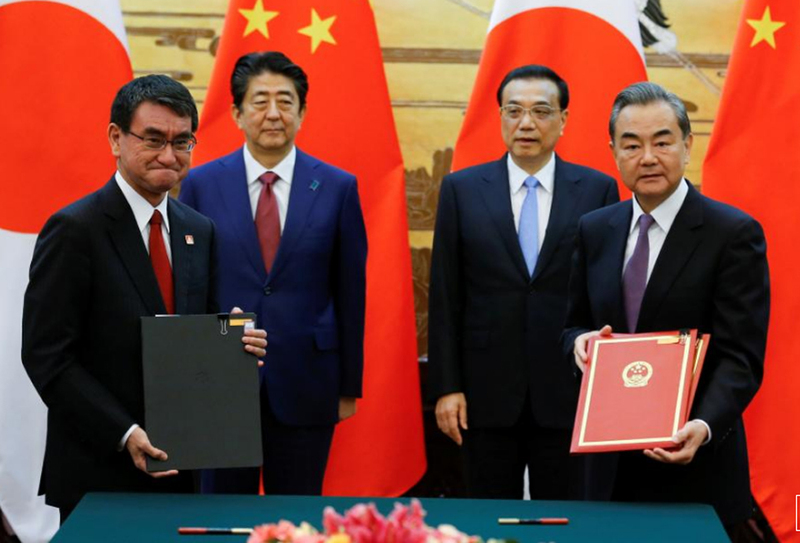 BEIJING, Oct 27: China and Japan on Friday pledged to forge closer ties as both countries stood together at an “historic turning point”, signing a broad range of agreements including a $30 billion currency swap pact, amid rising trade tensions with Washington. Japanese Prime Minister Shinzo Abe and Chinese Premier Li Keqiang also agreed the two countries would work together to achieve denuclearization on the Korean Peninsula. The pacts were reached on Abe’s three-day visit to Beijing as the two neighbors looked to carve out new areas of cooperation and seek ways to promote trust, which has been fragile at times since diplomatic relations resumed in 1972. Deals worth a total of $18 billion were signed between Chinese and Japanese companies during Abe’s visit. That reflects the “bright prospects” for cooperation between the two countries, said Chinese Premier Li Keqiang. “From competition to co-existence, Japan and China bilateral relations have entered a new phase. 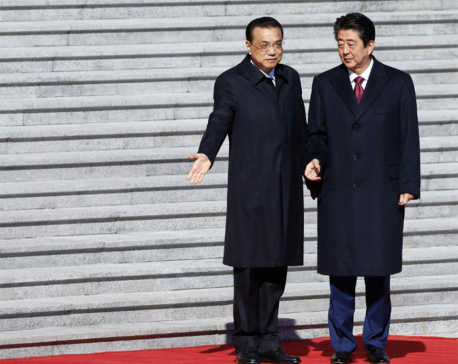 Hand in hand with Premier Li, I would like to advance our ties forward,” Abe told reporters after the pair met on Friday morning. Both countries are neighbors and partners, and will not become a threat to each other, Abe said after meeting with President Xi Jinping on Friday in the first full-scale Sino-Japanese summit since 2011. “With President Xi Jinping, I would like to carve out a new era for China and Japan,” Abe said. “That is worth cherishing by both sides,” Xi said. 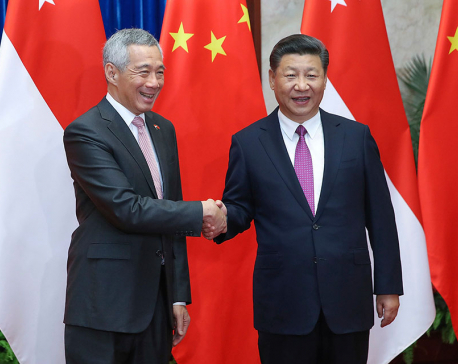 “Both sides should accurately grasp each other’s strategic intent, and implement what was agreed - that both sides will become partners, both sides will pose no threats to each other,” Xi said. Abe invited Xi to visit Japan next year. Xi said he would “seriously consider” a visit, a Japanese government spokesman told reporters in Beijing. “My impression is that President Xi responded positively. We need to nail down a date now,” he said. The Japanese government spokesman said Abe told Premier Li during their meeting that there would be “no genuine improvement” in bilateral ties unless there was “stability in the East China Sea”. Japanese firms including big auto companies like Toyota (7203.T) hope to see normalized ties with China so they can compete with U.S. and European rivals, while Beijing expects Tokyo’s endorsement of its ambitious Belt and Road program, an initiative that Xi hopes will further boost trade and transport links with other countries. Abe also said Tokyo was “determined” to normalize diplomatic relations with Pyongyang, but only if preconditions were met, including denuclearization and the release of kidnapped Japanese citizens. “Our two countries bear large responsibility in achieving peace and stability in this region,” Abe said. Efforts in advancing China-Japan ties should “persevere unremittingly to prevent the appearance of new twists and turns” so that previous efforts did not go to waste, said Li at a joint briefing with Abe on Friday. “The Chinese side is willing to work with the Japanese side to return to a normal track, and maintain the stable, sustained and healthy development of bilateral relations,” he said, adding that he had held candid discussions with Abe since his arrival on matters of mutual concerns. 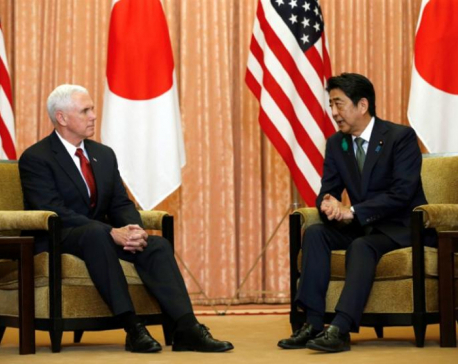 While Japan, worried about China’s growing naval power, is keen for closer economic ties with its biggest trading partner, it must manage that rapprochement without upsetting its key security ally, the United States, with which it has trade problems of its own. The two sides also signed a currency swap agreement of up to 3.4 trillion yen ($30.29 billion), effective until 2021. A deal toward establishing a yuan clearing bank was also inked.